11.11.2015 - Brunelli’s Steak House opened at the beginning of September and is housed in a traditional old Canarian building. Viewed from the street, it has quite a plain façade which speaks nothing of the delights that await diners inside. For a start, the premises are deceptively roomy. As you enter a hall you find the open kitchen, a lovingly decorated wine rack, and beautifully presented succulent cuts of meat in a display cabinet. 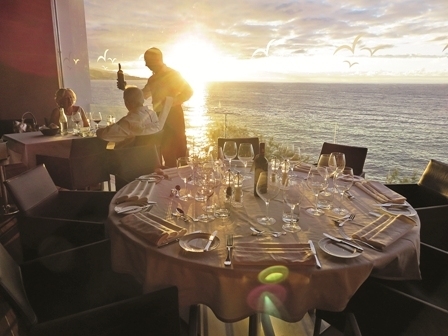 From there the intimate dining area opens up, and ahead of you are magnificent views of the ocean. The atmosphere is a mix of rustic flair, breathtaking views, style and elegance, with paintings adorning the walls at every side, including some by the famous César Manrique. One of the most incredible innovations is that the unique gigantic glass window pane which reveals the fantastic views and spectacular sunsets can actually be lowered during fine weather – creating a roofed-balcony feel that is comfortable, scenic and pretty impressive when that wall of glass gets moving. As its name implies, this is an American style steakhouse, designed for those who love good meat. The Kiessling family was inspired to create Brunelli’s during trips to the US, where they gathered ideas from the eateries which impressed them the most. Thanks to this inspiration the Canary Islands now have their very first Southbend oven - in the kitchen of Brunelli's. The grill can reach a temperature of 800 degrees, which seals the flavours of the meat quickly and firmly, creating a tasty, almost caramelised crust while the meat inside remains succulent and tender. Another special feature in this newest of restaurants is that the meat is matured for at least 28 days in special rooms with carefully controlled humidity levels and temperature. The master butcher, who can help you to choose the cuts to your liking, explains to guests that "Our beef comes from Holland and Denmark, for instance, from Hereford cattle which have been fed with fresh herbs.” He openly emphasises the quality of European meat, which he says is juicier than that from America, and regularly advises gourmet diners so they can learn to enjoy the cuts which best suit their tastes. T-Bone, Porterhouse, Chateaubriand, entrecote and (around one kilo) chops are like magic words to real meat lovers. Also worth highlighting are the house special hamburgers, Iberian pork chops, and a rack of New Zealand lamb – it’s a meat-lover’s paradise. Nevertheless, those who prefer fish can choose between dishes that include freshly caught fish of the day, lobster or squid, and vegetarians can be catered for too. Side dishes include baked potatoes, homemade fries, seasonal grilled vegetables and a variety of sauces. It’s not only the main courses that meet the highest standards, the starters and desserts are delicious and classy as well. For example, the beef tartare, prepared at your table, beef carpaccio, Iberian ham, prawn cocktail or fajitas filled with salmon, mushrooms, asparagus and guacamole. There is also a range of interesting salads to tantalise your tastebuds - glazed quail with bacon, or cured cheese and wild asparagus, for instance . Soup fans can choose between a French bouillabaisse, classic oxtail or Spanish gazpacho amongst others. Make sure you leave room for a dessert: it would be a shame to miss the cheesecake with rum, banana fritters with hot chocolate sauce or chocolate pudding with cranberries. The highest quality with a pleasant atmosphere and fair prices form the basis of the Brunelli’s concept. The incredible view, professional service and true gourmet experience are testaments to the success of the family’s dream. And the restaurant certainly opened in style: on Wolfgang Kiessling’s birthday on September 7. At the age of 78 he’s still got what it takes to enrich the island with new attractions. Open: Daily 1pm to 3.30pm and 7pm to 11pm.